1) We will be passing out flyers raising awareness this Sat (Feb 8th), 11 AM in front of Grocery Outlet in the Central District/ Africatown (1126 Martin Luther King Jr Way). 2) We will also be passing out flyers this Sun (Feb 9th), 11 AM in front of the Red Apple store on 23rd and Jackson. 3) On Thurs the 13th at 6:30 pm, Seattle Public School officials will be holding a public forum at Meany Middle School, 19th Ave E. and E. Thomas St. We will be setting up the mock isolation booth outside that meeting and will be engaging parents and community members in discussion as they enter the meeting. Categories Class, Event, Flyers, Mass Incarceration, Organizing Strategies, Race, What's happening in Seattle? 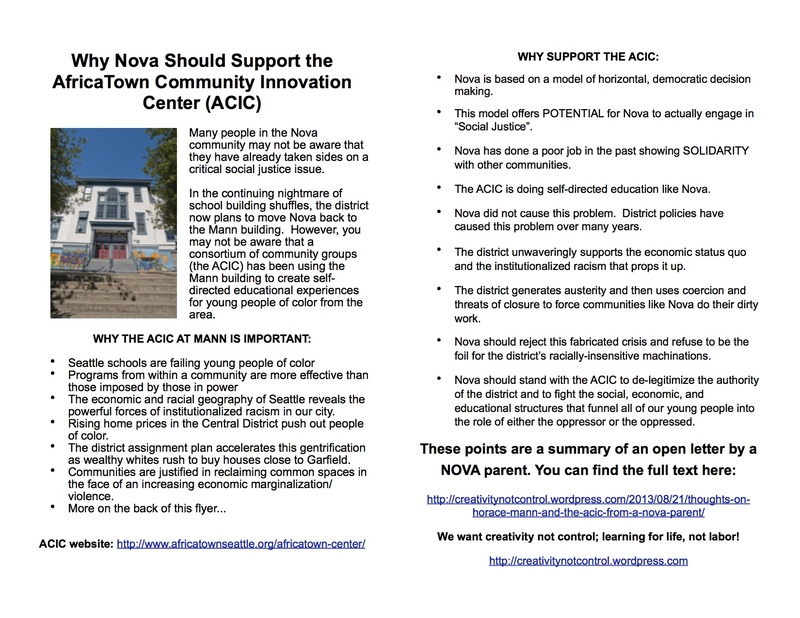 At the last school board meeting, and NOVA parent and contributor to this blog read this open letter to the NOVA community regarding the current debate over the use of the Horace Mann building in the Central District. We also passed out the flyer below, which summarizes the points in his letter, and folks are also sharing these with the NOVA community. If you know anyone who studies or teaches at NOVA, or parents who have students there, we encourage you to share this with them. Categories Flyers, Parent / Family Organizing, Race, Solidarity Statements, What's happening in Seattle?